On the endangered technology watchlist, one of the few remaining telephone booths left over from the last century, is hiding out on Pender Island. And it hasn’t even been vandalized. That’s what a great place Pender Island is! You are a true islander if you feel odd when someone doesn’t wave or say hello in passing. Then you start to think, “Are they mad at me for some reason”. Your imagination starts to run wild, and you bolt down to the phone booth and go through your telephone tree list hoping to find out what’s what. What a beautiful relic. 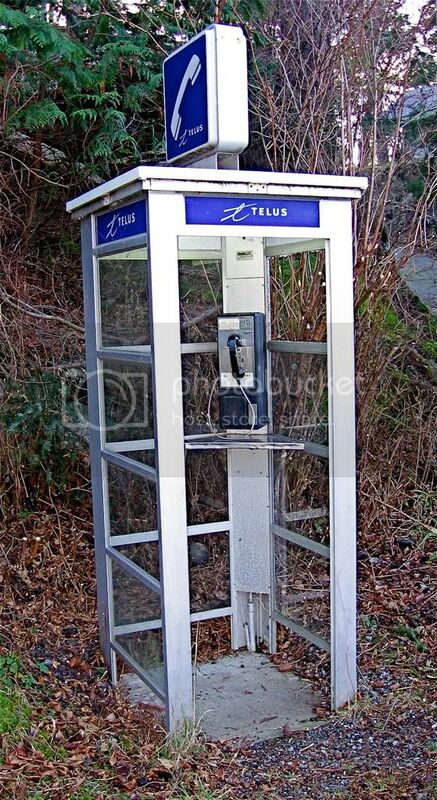 I remember when the store at Hope Bay burned down and the phone company replaced the payphone. It was surreal to see this new phone attached to the burned out hulk. I suppose it won’t be long before tourists come to Thieves Bay to have their picture taken by the phone booth.